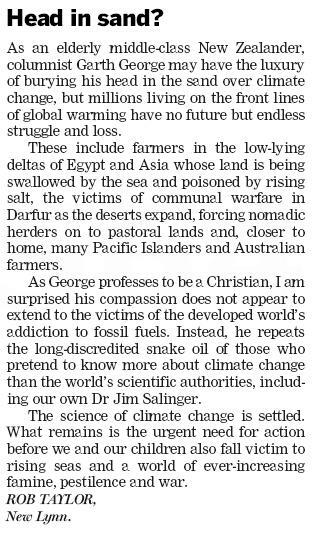 Last week again revealed one of the worst traits of the New Zealand media in its approach to covering climate change – giving people prime real estate to mouth off about climate-science realted subjects they are ill-equipped to comment on. 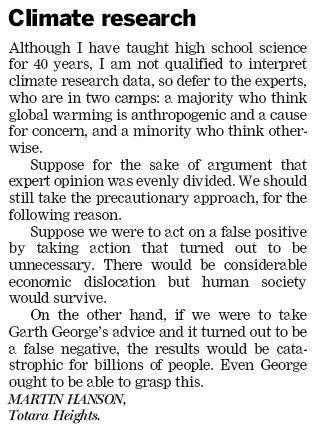 Luckily, Herald readers aren’t as meek and gullible as Garth George estimates, as the letters from the Weekend Herald listed below reveal. 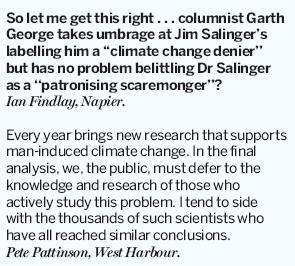 I don’t think editorial material is so emplematic of New Zealand media’s shortcomings in science coverage. The WSJ editorial pages are famous for their dismissal of science, in contrast with the news coverage.